Harvard University Press, 9780674242425, 248pp. The Big Bang: A Big Bust? The cosmos seems to be in crisis, and you don't have to be a rocket scientist to see it. How, for instance, can the universe be full of stars far older than itself? How could space have once expanded faster than the speed of light? How can most of the matter in the universe be "missing"? And what kind of truly weird matter could possibly account for ninety percent of the universe's total mass? 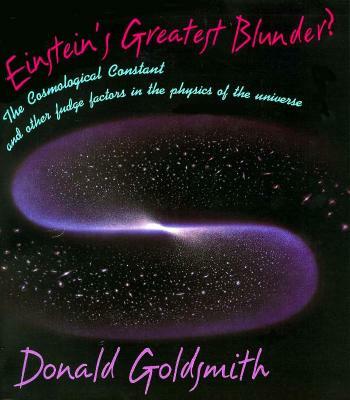 This brief and witty book, by the award-winning science writer Donald Goldsmith, takes on these and other key questions about the origin and evolution of the cosmos. By clearly laying out what we currently know about the universe as a whole, Goldsmith lets us see firsthand, and judge for ourselves, whether modern cosmology is in a state of crisis. Einstein's Greatest Blunder? puts the biggest subject of all--the story of the universe as scientists understand it--within the grasp of English-speaking earthlings. When Albert Einstein confronted a cosmological contradiction, in 1917, his solution was to introduce a new term, the "cosmological constant." For a time, this mathematical invention solved discrepancies between his model and the best observations available, but years later Einstein called it the "greatest blunder" of his career. And yet the cosmological constant is still alive today--it is one of the "fudge factors" employed by cosmologists to make their calculations fit the observational data. Theoretical cosmologists, shows Goldsmith, continually reshape their models in an honest (if sometimes futile) effort to explain apparent chaos as cosmic harmony--whether their specific concern is the age and expansion rate of the cosmos, hot versus cold "dark matter," the inflationary theory of the big bang, the explanation of large-scale structure, or the density and future of the universe. Engagingly written and richly illustrated with photographs taken by the Hubble Space Telescope, Einstein's Greatest Blunder? is a feast for the eye and mind.